My take on the messy, low bun. If there's one thing I have zero patience for, it's doing my hair. Particularly when it comes to the act of drying it. Don't get me wrong, I love a professional blow dry (for those of you in LA, Stacy at Méche is uh-mazing), I just HATE doing it myself. I can think of 100 other things I'd rather be doing in those 10-15 minutes. Lately, I've been wearing my hair in some sort of loose up do or pony tail. I'm totally inspired by these images I found on Pinterest and can't wait to experiment with some new styles. 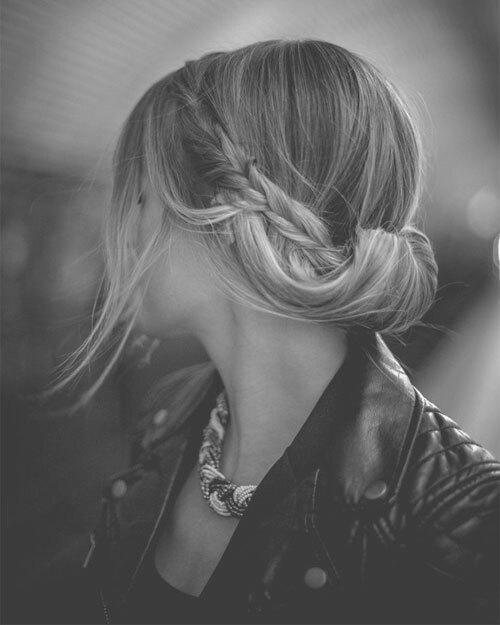 What hair trends are you loving these days? Who can forget the Topsy Tail? Super cute! love your take!